RegServe – Eliminate Registry Errors – Automatically ! RegServe is just one of the award winning software’s developed by Xionix. Since 2007 Xionix has served millions of satisfied customers worldwide who are looking for simple and effective ways to increase computer speed, stability, and restore lost computer performance. RegServe makes managing your computers registry easy by automatically scanning your computer for corrupt or damaged registry files. As errors are found, RegServe automatically fixes them for you. RegServe can also be configured to routinely scan your computer and provide ongoing maintenance. Eliminate registry errors, defragment and optimize your hard drive, and manage your Startup to Increase Startup Speeds! RegServe will automatically scan your computer to identify errors that may be impacting your computer performance. Maintain your computers health using automatic scheduled registry scans and system maintenance with RegServe. By eliminating errors and optimizing your computers registry, you can prevent dreaded symptoms of an aging computer. Password protect files, backup & export data, and Free Up Resources by reducing file sizes up to 97% – Free w/ RegServe! We offer a 60-Day money back satisfaction guarantee if you are not happy with your purchase of RegServe. Why use RegServe to Clean Your Computers Registry? Your computers registry is essentially a database of tens-of-thousands of files that are accessed by your computer to perform an array of tasks. Since millions of requests are made to your computers registry, it is important that your computers registry is optimized and regularly maintained. Managing your computers registry can be performed manually, but is a difficult task even for advanced users. Incorrect entries or alterations made in your computers registry can also result in a computer crash or defective computer. For these reasons, most user prefer an application to manage their computers registry. RegServe will automatically scan your computer for missing, corrupt, or partially deleted registry entries. 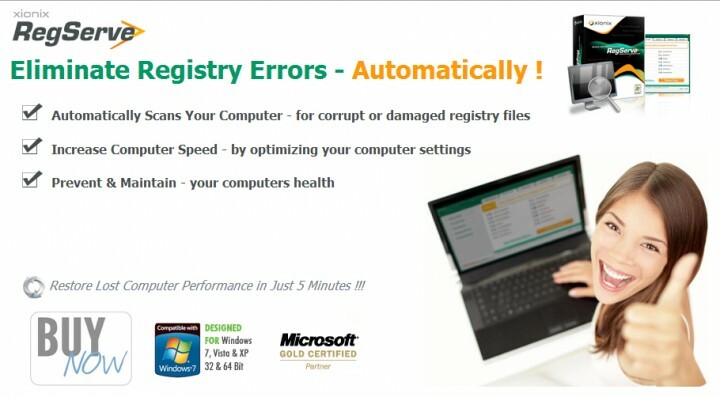 Registry errors will be corrected automatically and requires no technical knowledge. RegServe also includes a registry defragmenter which optimizes requests made to your computers registry, resulting in faster computer speed. To further increase your computer speed, RegServe also includes a startup manager that allows you to manage which applications boot during startup – slowing your computer. Download an evaluation version of RegServe to see how RegServe can increase your computers performance ! FREE BONUS – When you register your copy of RegServe you will also receive a complimentary issue of the Xippit File Compression Utility. Xippit uses our proprietary .xip format to safely secure, password-protect, and reduce the size of any file or folder. Registry Scan – The RegServe registry scan searches your computer for invalid, corrupt, orphaned registry entries, and registry errors. Using the comprehensive registry scan, RegServe will search fifteen (15) areas of your computers registry and detect items that may be impacting your computers performance. Registry Defrag – The registry defrag process is designed to increase your computer speed and free resources by managing the overall size of your registry and how requests are made. Auto-Scheduled Scans – After establishing a desired setting and frequency, auto-scheduled scans allow you to automate future registry scans. When enabling this feature, RegServe will automatically start the date you specify and scan your computer for registry items. Detailed Scan Results – Following any registry scan, RegServe provides you with a detail report for the areas of your registry selected for repair. At this point, you may also select which registry items (if any) you would like RegServe to overlook during the repair process. Built-In Ignore List – The built-in ignore list ensures maximum compatibility with third-party applications. If you have deselected items from the registry scan results, they will be added to the ignore list automatically. Keywords may also be entered into the ignore list to prevent any possible conflict from arising. Registry Backup & Restore – Prior to each registry repair, RegServe creates a log file that contains backup information with your previous registry settings. Using the Restore feature you can revert your computers registry to a previous setting if desired. Windows® Startup Manager – View and manage applications that launch during startup. The Startup Manager allows you to improve slow computer load times by freeing up computer resources and disabling applications you do not wish to load automatically. Custom Settings – Using the Settings feature you can override the default settings of RegServe to meet your individual requirements. RegServe gives advanced and novice user the flexibility to customize how RegServe operates on your computer. Diagnostic Reports – If you encounter a problem while running RegServe, our technicians are standing by to assist you. Using the Diagnostic Reporting tool, you can provide us with detailed information regarding the encountered issue. Live Program Updates – RegServe uses plug-in framework which allows us to provide you with the most up to date features and version releases. You receive updates real-time when opening RegServe !